A few of you were wondering what happened to the race organizer in the suit trying to chase down Kathrine Switzer at the Boston Marathon and rip off her race numbers because she was a woman and he didn’t want any women running in his race. Turns out, a huge dude body checked him. As an abbreviated Saturday post, (and since you all are such blood-thirsty, violent types) I thought I’d post the pics here for everyone to see. 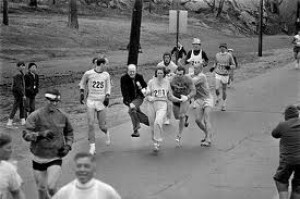 – Check out Kathrine Switzer’s determination. Ladies, she wasn’t giving up, and she wasn’t handing over her numbers. Keep that in mind, and keep running your own race, whatever it might be. – Check out the small mob of supporters around her. These men were determined to help her finish her race. No matter how strong and determined an individual might be, everyone needs the support of other people from time to time. Are you willing to body check a race organizer for someone? – Someone took these photos. I wish I could give a credit, but I just couldn’t figure out who took them. But the point is this: every story needs someone to chronicle it, or it will be forgotten. And when a story is forgotten, it might as well never have happened. If you’re a writer, or a photographer, or an artist, or a musician, or a teacher, or a human being: preserve the stories. Pass them on. Stories are one of the few weapons of power given to the weak and downtrodden, and storytellers can give gifts of significance to those viewed as lowly or insignificant by giving voice to their stories. Stories can turn the world on its head. For part one of “When a Woman Isn’t Allowed to Run the Race,” click HERE. as you share life with others, even if you are not a creative soul, is incredibly valuable. shared their story with me face to face, heart to heart. I love this body checking dude. I want to hug him. He is my mental inspiration next time I run interferance for someone. Keep it up Shawn. If you get a chance, Maria (and if you haven’t already done so), check out the video that Melissa posted on my writer’s page on Facebook. 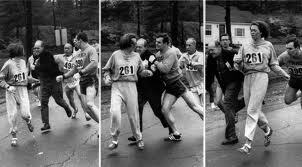 Kathrine Switzer talks about this moment, and it’s a cool story to hear from her perspective.